Charming traditional Irish thatch cottage and renovated barn with gardens and stream. 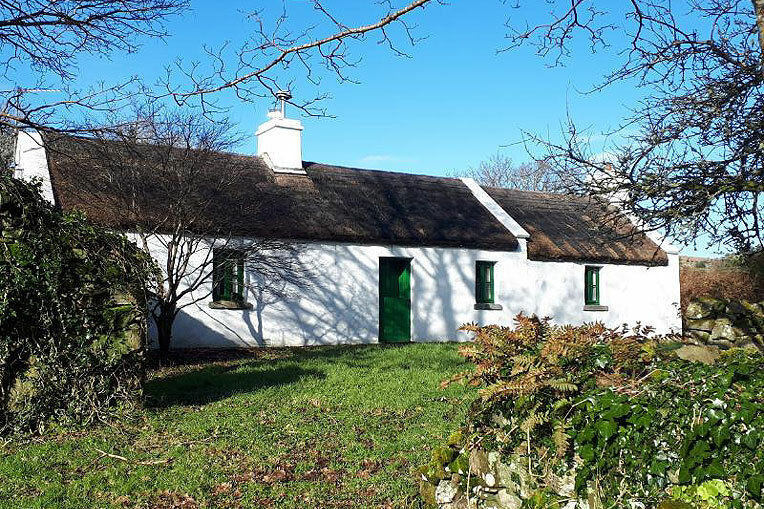 Moon Cottage is a charming traditional Irish thatch cottage and renovated barn with gardens and stream, situated in an area of outstanding scenic beauty with superb views and country walks. Located just two miles from the pretty fishing village of Clonbur, this is an extremely attractive property. The beautiful and mysterious Lough Coolin is a short walk from the property, which commands superb and panoramic views over the surrounding countryside. The property is accessed from a quiet country road about two miles from Clonbur. The cottage accommodation comprises a living room/ dining room with feature fireplace, fully fitted kitchen, shower room, and a double bedroom. The barn includes a family bedroom upstairs and a kitchen / dining room and shower room downstairs. It is ideally situated to enjoy the beauty and serenity of the West of Ireland, with a wealth of country and rural activities at your doorstep such as mountain walking, swimming, horseriding, fishing, watersports and so forth. The property is within easy driving distance of Connemara, an area of outstanding natural beauty. Other nearby attractions include world renowned fishing on Loughs Corrib and Mask, historic Ashford Castle where many heads of state have stayed, the magnificent 19th century Kylemore Abbey and Killary fjord. An 18 hole golf course is 15 minutes away. Galway City is 45 minutes with lots of lovely pubs, restaurants and shops. Cong Abbey ruins are very beautiful if you are looking for peace and tranquility and Ballintubber Abbey is just 35 minutes away.